"Frog Prince", "brookline", "fairy tale", "frog puppet", "perry alley theatre", "puppet showplace", "theater for kids", "things to do in boston"
Frogs, Frogs, and More Frogs! Series of puppet shows that celebrate exciting and diverse work by puppetry artists from the Northeast. We're going froggy this weekend here at Puppet Showplace! Join Andrew and Bonnie Periale of the Perry Alley Theatre for a hopping good time as they perform the well-known tale "The Frog Prince," along with two other froggy fables. "The Frog Prince and Other Frogs"
Hop along with Perry Alley Theatre through the wonderful world of Frogs. This show includes the beloved “Frog Prince,” in which an exceedingly silly Princess is helped by an enchanted frog and learns not to make promises she can’t keep. Then, in "The Evolution of Frogs"-- Dive with us into the depths of ancient oceans to follow the evolution of one-celled creatures into clams, worms, fish and finally ancient frogs—a riveting romp through pre-history. Finally, in "Frog and Eggplant"--Two friends are dissatisfied with their lives, and wish they could trade places. A spirit overhears them and grants them their wish, with disastrous (and hilarious) consequences! Andrew and Bonnie Periale founded Perry Alley Theatre in 1986 and moved to their current home and studio in NH in 1988. Together, they’ve produced a dozen major shows and many shorter pieces for touring. 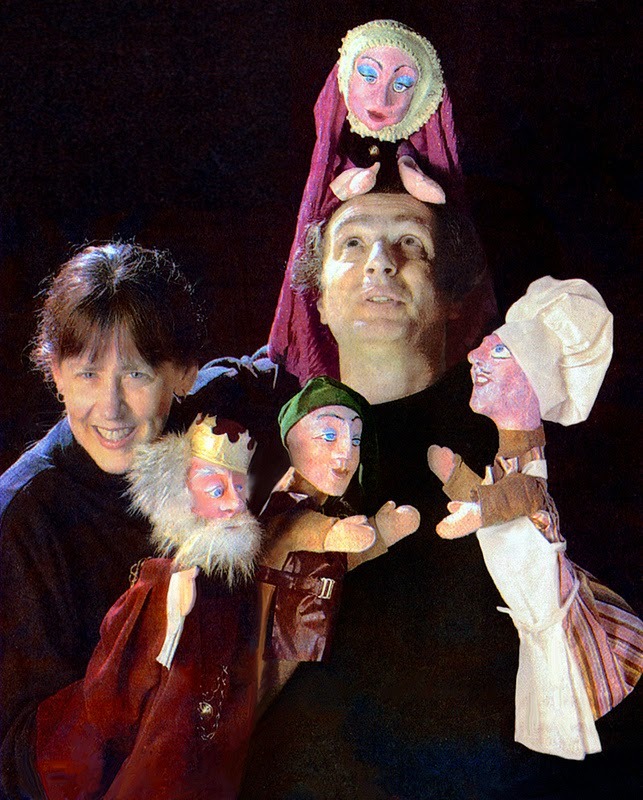 Andrew and Bonnie have performed at numerous national and regional festivals, at the Smithsonian Institution, the Center for Puppetry Arts (Atlanta), the Jim Henson International Festival of Puppetry and many other venues across the U.S. as well as in France and Italy. They have produced the magazines for UNIMA-USA for 28 years, establishing Puppetry International magazine in the early 1990s. Recognition includes The Paul Vincent Davis Award, the George Latshaw Award, 3 Henson Foundation grants, 2 UNIMA Citations, an Emmy nomination, finalists in the International Festival of Film and Television and, from UNIMA-USA, a Lifetime Achievement award. "Festival", "Frog Prince", "John McDonough", "brookline", "fairy tales", "hand puppets", "puppet showplace", "puppetry", "theatre", "things to do with kids"
Hop-on-over to Puppet Showplace this weekend! About the show: Young Prince Tad has been caught teasing the forest creatures again! A magic tree turns him into a frog to teach him a lesson. Along the way, he meets a princess who could turn him back with a kiss. Will she do it? Yuck! All ends happily as the characters learn about being kind and keeping promises. "The Frog Prince" features a cast of colorful puppet characters, audience participation, live voices and sound effects, and fun behind-the-scenes puppet demonstrations. 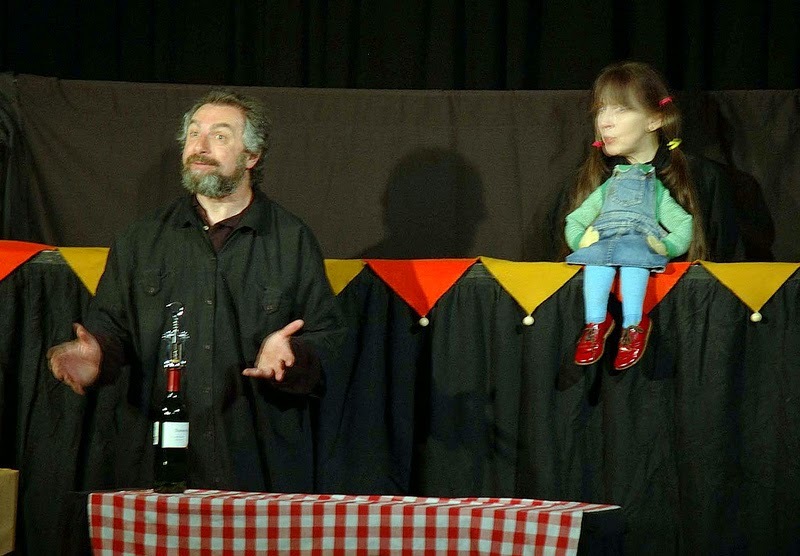 Pumpernickel Puppets shows are a great introduction to live puppetry, and they work well for our youngest audiences. The characters are eye-catching, the storytelling is straightforward, and the performance has breaks built in between sections of the show for wiggly audience members. John McDonough has a gentle yet energetic personality that captivates audiences of all ages. About the performer: The Pumpernickel Puppets are the creation of John McDonough of Worcester, Massachusetts. John was four years old when he saw his first puppet show, and he immediately knew that he wanted to be a puppeteer. By his teens, John was presenting shows all over the New England area. The Pumpernickel Puppets have had the honor of appearing at The Puppet Showplace Theatre, Boston Children’s Museum, The Institute of Professional Puppetry Arts at the Eugene O’Neill Theatre Center, The Smithsonian Institution in Washington D.C., The Cultural Olympiad at The Center For Puppetry Arts in Atlanta, Georgia, and the prestigious International Festival of Puppet Theatre sponsored by the Jim Henson Foundation at the Joseph Papp Public Theatre in New York. For each production, John creates and performs all of his own puppets, which range from small hand puppets to larger-than-life figures. "Fall Fairytale Festival", "Frog Prince", "Pumpernickel Puppets", "Puppet showplace theatre", "family fun in boston", "fun things to do with your kids"
Welcome back, readers. It's me, Esra Erol - marketing intern at PST - and I'm here to take you on another "behind-the-scenes" adventure. This time, it's all about The Frog Prince, which is due back at PST this week. But first! Allow me to introduce you to the man behind the Pumpernickel Puppets: John McDonough. John's story begins when he was just a wee lad. That's right. He was only four-years-old when he saw his first puppet show and thought, "Hmm...I think I want to be a puppeteer." You know what? Scratch that. John didn't think he wanted to be a puppeteer. John knew - he was absolutely certain - that he wanted to be a puppeteer. Seriously. He was on a mission. By his teens, John was performing a large number of puppet shows throughout the New England area, including here in Brookline, specifically on the stage of our very own PST, which John might as well call "home" since he's been here so many times - much to our delight! Over thirty-seven years later, John is still entertaining audiences with his beautifully crafted puppet pals. They've appeared here in Boston at The Boston Children's Museum as well many out-of-state institutions, including: The Institute of Professional Puppetry Arts at the Eugene O’Neill Theatre Center in Waterford, CT, The Smithsonian Institution in Washington D.C., The Cultural Olympiad at The Center For Puppetry Arts in Atlanta, GA, and the prestigious International Festival of Puppet Theatre sponsored by the Jim Henson Foundation at the Joseph Papp Public Theatre in New York. For each production, John designs and creates all of his puppets, which range in size. Some of 'em are small hand puppets while others are life-size figures - sometimes bigger! He also manipulates the entire cast and provides the voices and sound effects as well. He even has his very own portable stage, which can be set up in any indoor location and comes complete with sound and lighting. All that he needs is a 7x7 ft. square space with a 7'2" floor to ceiling clearance and a regular electrical outlet nearby. Now, if you haven't seen John and his mechanics at work (and you're dying to know what it's like to see his work come to life), do not fear because we've got a pictorial history of some of the performances he's done over the last few (and most recent) years, including: The Lion and the Mouse and Three Billy Goats Gruff in 2010, and then Peter Rabbit and Sir George and the Dragon the following year - all of were met with great success. 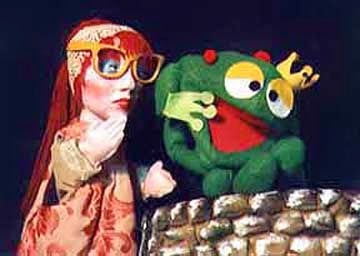 Yes, John's puppet pals are sure to "wow" audiences of all ages, especially this week with The Frog Prince (BUY TICKETS). We insist you come on down to PST and watch the beautiful Princess kiss the slimy Frog. We promise, he'll turn into a handsome Prince soon enough! 'Till next time! Yours truly, Esra Erol - marketing intern. About the Show: Young Prince Tad has been caught teasing the forest creatures...again! As punishment, a Magic Tree turns him into a frog, hoping to teach him a lesson. Along the way, Tad meets a Princess who could turn him back with - brace yourselves - a kiss. Yuck! Will she do it? All ends happily as the characters learn about being kind and keeping promises. About the Performer: The Pumpernickel Puppets are the creation of John McDonough of Worcester, Massachusetts. He was four years old when he saw his first puppet show and he knew immediately that he wanted to be a puppeteer. By his teens, John was presenting shows all over the New England area. The Pumpernickel Puppets have had the honor of appearing at the Boston Children’s Museum, the Institute of Professional Puppetry Arts at the Eugene O’Neill Theatre Center, the Smithsonian Institution in Washington D.C., the Cultural Olympiad at the Center For Puppetry Arts in Atlanta, Georgia, and the prestigious International Festival of Puppet Theatre - sponsored by the Jim Henson Foundation - at the Joseph Papp Public Theatre in New York.